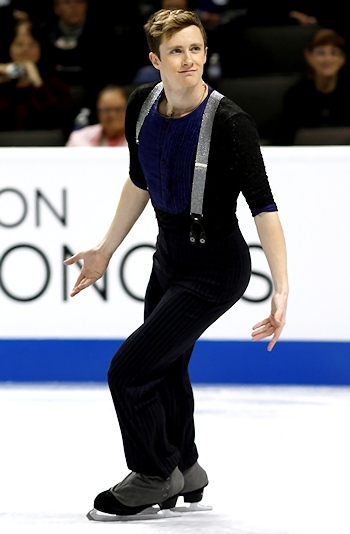 Jeremy Abbott performs his Short Program at the 2012 U.S. Figure Skating Championships. Jeremy Abbott, the two-time U.S. Champion, reestablished himself as the man to beat after a disappointing fourth place finish at last year’s championships in Greensboro, N.C. The 26-year-old danced his way to the top of the standings after the Championship Men’s short program at the 2012 U.S. Figure Skating Championships, taking a seven point lead into Sunday’s free skate. Abbott put everything into his swing dance program, and was rewarded with the highest component marks of the night. The Grand Prix Finalist opened with a snazzy triple flip-triple toe loop combination, and never looked back. The leader earned a whopping 90.23 points, the highest men’s short program score at the U.S. Championships. Finishing in second place was Abbott’s training mate, 22-year-old Adam Rippon with 82.94 points. Rippon skated second in the competition, and he was atop of the leader board for more than two hours. Rippon, who has a history of not performing well at the U.S. Championships, received some encouragement from senior lady Ashley Wagner, who has had similar luck. Rippon performed a smooth-as-butter program to Bond’s Korobushka, and nailed each one of his triple jumps with confidence. The highlight of the program was his ‘Rippon Lutz’, which he performs with both hands over his head. The surprise of the evening was 20-year-old Armin Mahbanoozadeh, who had a challenging fall season and looked to be headed for the bottom of the standings as this competition approached. Knowing that he needed some inspiration, Mahbanoozadeh headed to Colorado Springs, Colo., to train with jump expert Christy Krall. Like the top two, Mahbanoozadeh did not push the technical envelope—focusing instead on a clean program. The 2010 Skate America bronze medalist landed each of his triple jumps with confidence, and earned his personal best score along the way—80.66 points. Last year’s bronze medalist, 21-year-old Ross Miner, finished in fourth place, having trouble on the back half of his triple Lutz-triple toe loop combination. He is within striking distance of making the world team with 78.90 points. Keegan Messing, the 20-year-old from Anchorage, Alaska, finished in fifth place with his Robin Hood program. He earned 76.66 points, while 19-year-old Max Aaron, last year’s junior champion, is in sixth place with 76.01 points. Aaron was the only skater in the only 20-man field to land a quadruple jump in the competition. Richard Dornbush, the reigning silver medalist made errors on each of his jumping passes, and sits in a dismal 17th place.